Since moving into our flat, Harry and I have been at odds over how to decorate our bedroom. We already have a number of frames up in our living room (including Harry's giant Captain America poster, a typography print of our memories, a photo of us at Disney World and our caricature) but the bedroom was still proving to be a bit of an issue. As we rent we can't put up wallpaper or paint but we are allowed to put up pictures. I had been tempted to buy one of the wall art quotes, but as we were unsure what damage it may do to the paintwork we decided against it. We already have a number of unused frames that I have acquired from my old bedroom and decided to reuse but unfortunately we don't have any more photos that we want to put up. After lots of browsing on Pinterest I suggested that we create a montage wall gallery using our collection of different frames and lots of different prints that could easily be changed. We set off to our local B&Q to check out their wall paper samples and tore off some of the ones we liked the look off. We were aiming to get a range of different styles and colours in order to incorporate our different likes and interests and get some 'pops' of brightness. We also had a look in our local Homebase and bought two additional large dark brown frames from The Range for less than £10. When we got home I arranged all the wallpapers on the floor to work out which would look best on the wall. I decided that both the birdcage prints were my favourite and would suit the large frames best because bothof their designs were also on the larger side. I selected the bright pink, red and blue wallpapers for the small frames to add pops of colour and then the neutral coloured prints for the medium black frames which were also perfect for the corset and images. I then arranged all of the frames on the floor so I could move them into different layouts while Harry started cutting up the wallpaper using a cutting board and stanley knife. Once we had decided on a layout we liked we used sandpaper to rub down the back edges of the frames and then used Command Picture Hanging Strips to attach them to the wall. The strips are really easy to use and you can get them in different sizes to hold frames of different sizes and weights. We were unsure about them at first but our landlord recommended that we use the strips instead of hooks or nails and so far we have had no problems with them. The best thing about the wall montage is that we can easily change the prints inside. If we get sick of one of them, or if we see another print, wallpaper or photo that we really like we can just replace the wallpaper inside the frames. It was also really cheap and easy to achieve, and I think it looks really effective! What do you think? 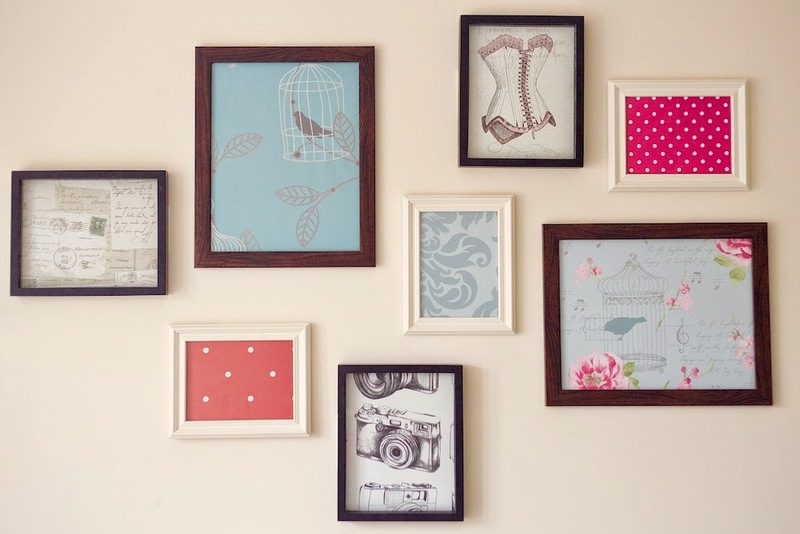 Have you got any tips for decorating your walls?